As we enter the season for reviews of the year, when every broadsheet surveys the last twelve months through the lens of different industries, it has to be said: it’s been a terrible year. Unless like a 20th century Futurist, or a 21st century member of the alt-right or far-left you relish for its own sake the complete overthrow of so many political certainties. It feels rather as if the world has tilted on its axis in 2016, and the immediate future is a fragile thing, no longer insulated by a decades-long inertia of the status quo. 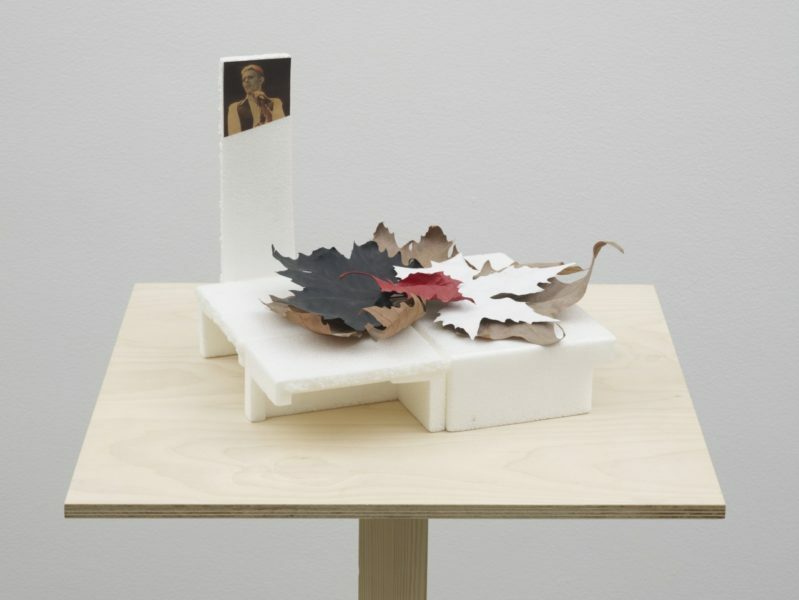 Michael Bracewell’s exhibition at Maureen Paley in Bethnal Green provides a sober ending to the year – entirely congruent with the prevailing mood. I came to see it on a day on which the sun never seemed to rise: a grey pall hung over London and left it in half-light from dawn to dusk. There’s also been too much pathetic fallacy this year. Michael Bracewell is a cultural commentator and writer whose frame of reference is dazzlingly broad. 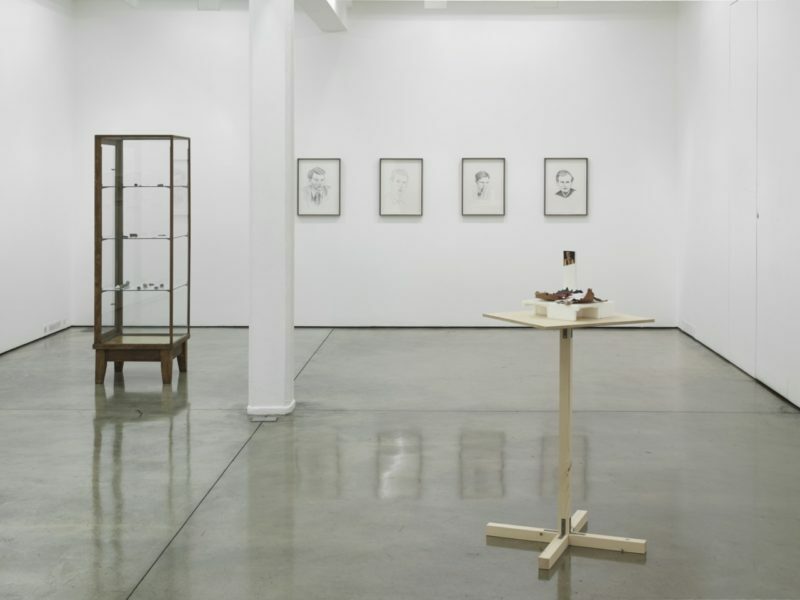 His exhibition was planned, it appears, around the time of the Brexit vote in the UK, and it is a testament to his accuracy in the reading of runes that he predicted six months ago that the referendum result indicated not an endpoint, but a direction of travel globally. Stephen Spender is the presiding genius loci for the show, and a quotation from his 1951 autobiography is the first wall text one encounters: “From 1931 onwards, in common with many other people, I felt hounded by external events. There was ever-increasing unemployment in America, Great Britain and on the Continent. The old world seemed incapable of solving its problems, and out of the disorder Fascist regimes were rising.” There is a developing narrative in the press right now, connecting our current crisis with that of the early 1930s. 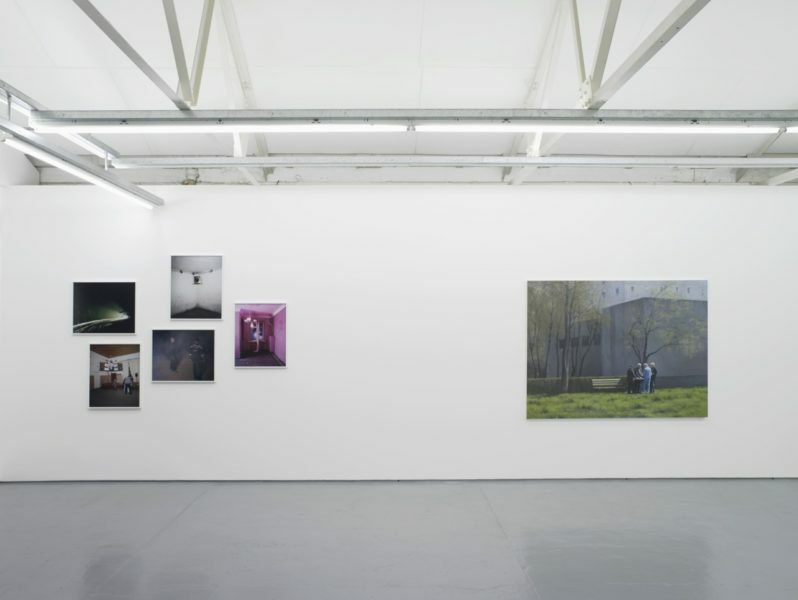 Michael Bracewell has chosen to show work by three artists who hail from former Soviet bloc countries and whose project is to document the reality of life in the post-Soviet, or post-utopian era. It was fashionable in the late 90s and early 2000s to examine the failure of 20th century utopian politics, but the re-examination now takes on an entirely different, far less romantic tenor. 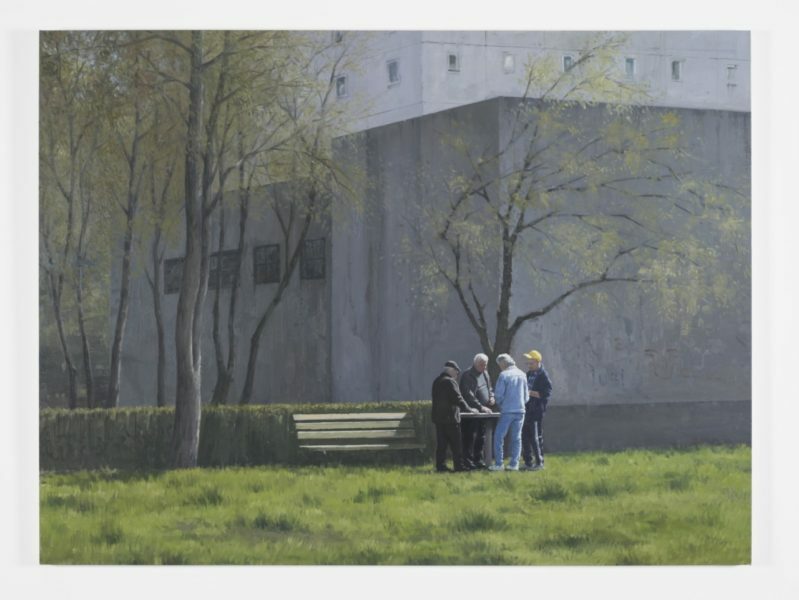 Serban Savu’s paintings document contemporary life in Romania. His three paintings here present atmospheric tableaux that remain entirely ambiguous in tone and intent. 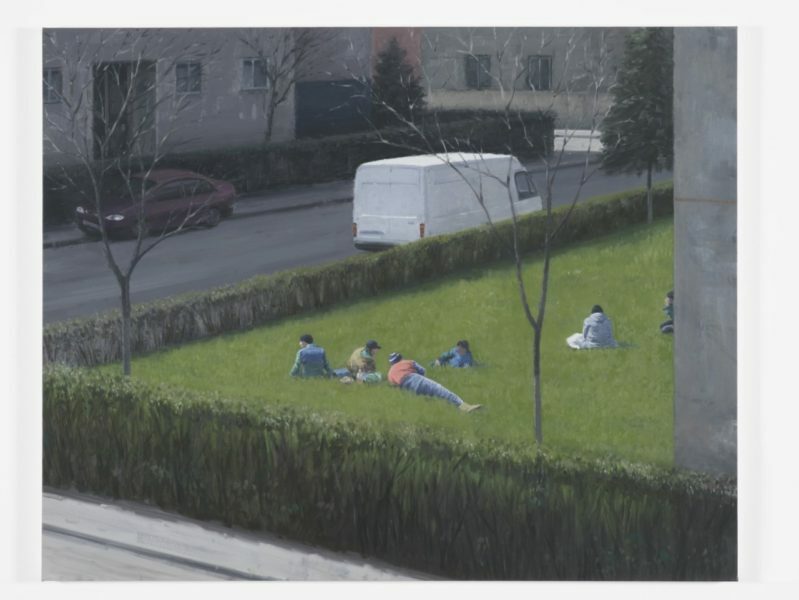 In Small Talk After Lunch, 2012, a group of male figures lounge in long grass in a hedged-in garden amidst an urban landscape. The lushness of their immediate surroundings is at odds with the bare branches of the trees that line the street beside the park, and the flat grey of the blocky buildings alongside. It is as if two seasons abut at the line of the hedge, and our protagonists lounge in warm sunshine. A suggestion of a bottle lies in the grass beside one figure, conjuring a hedonistic dejeuner sur l’herbe in a most unprepossessing environment. Savu creates an irresistible tension in his figurative compositions that speaks long about the complexities he is addressing. Similarly, in The Card Players, 2011 – a title that surely must invoke Cezanne’s elysian, pre-first world war vision of the world – a knot of men stand around a table in the shadow of more grey, modernist concrete buildings. Birch trees in tender leaf soften the outlines and seem to denote the passage of time since new ideologies brutally imposed their vision on the world. 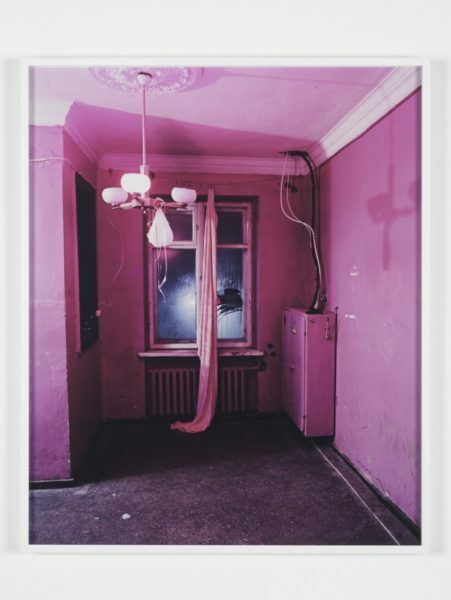 Andrew Miksys presents a group of digital c-prints, showing scenes from Lithuania a decade ago: dilapidated interiors, all the more mournful for their evidence of attempts to party. Lucy McKenzie is here with a group of compellingly precise pencil drawings of the famous British spies of the 50s: Donald McLean, Kim Philby, Anthony Blunt and Guy Burgess. It’s great to see her works on paper, after a greater familiarity with the paintings. 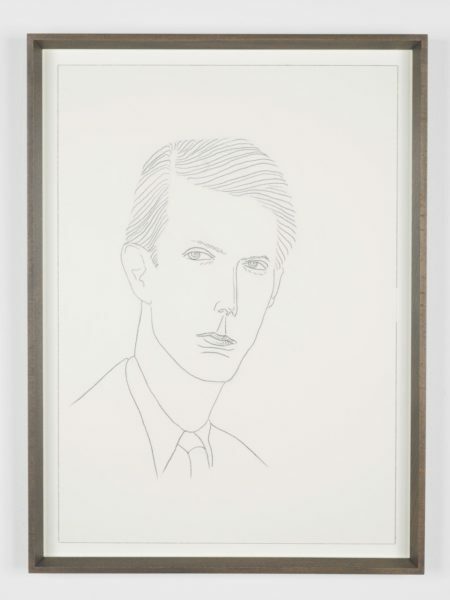 The portrait of Anthony Blunt puts one in mind of the very early, hallucinogenically detailed drawings of Lucien Freud. These drawings provide a fulcrum in the show: not so much depicting traitors as men whose political convictions ran dramatically counter to the establishment. Similarly, Gareth Jones’ David Bowie Memorial Carport, 1994 reminds us of all the poets we have lost this year: individuals whose voices and values have been cornerstones of our world: Leonard Cohen, Prince, Muhammed Ali, Harper Lee and Bowie himself. Each one’s passing has been a singular shock. 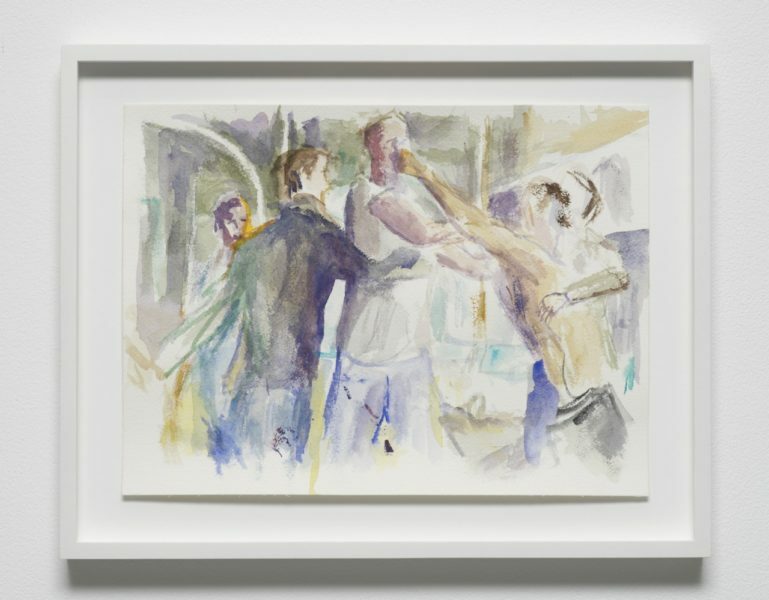 John Kelsey’s intense small watercolours depict street brawls, some of which coalesce around intimate clinches that could equally well be amorous. A masked-out white triangle in one, the symbol denoting the ‘play’ button for video on screen, seems to categorise these images as camera-phone material. The authority of traditional news reporting, we are reminded, has toppled and fallen in the face of powerful new social media. Michael Bracewell tips in references to the influence of science fiction with a cabinet holding fragments of meteorites and metamorphic rock fragments. 20th century science fiction grappled with philosophies and the emerging technology of space exploration to interrogate the potential futures of human civilization on earth and beyond. Bracewell seems to suggest that perhaps everything is up for grabs again. But it’s not ‘just a little bit of history repeating’. It’s different this time.